To reduce your cost, Brandsport offers this item in Bulk (sold here individually). 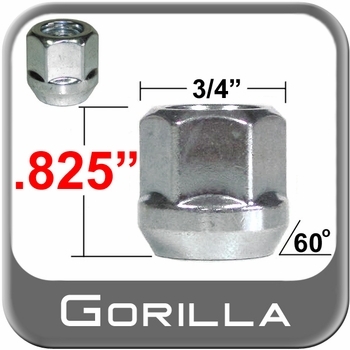 Gorilla also lists this same item in 4-piece sets as Display Package # 40027 and Bag # 40027B. Tough quality control standards ensure a precise seating surface. Expect safety and years of performance thanks to the hardened steel construction. High quality zinc plated plating provides outstanding finish. Add a cool custom look to your ride with zinc plated lug nuts.